LIC AAO Admit Card 2019 – Life Insurance Corporation of India (LIC) will issue the LIC AAO Call Letter 2019 for the preliminary examination on April 22, 2019. The candidates will be able to download the call letter up to April 30, 2019. The LIC AAO Admit Card 2019 is made available at the official website i.e. www.licindia.in. For downloading the call letter / admit card candidates have to enter login credentials such as Registration Number/Roll number and Password/Date of Birth on the login page. Preliminary Examination is scheduled to be conducted on May 04 and 05, 2019. LIC AAO 2019 Admit Card for each stage of the examination will be issued separately. From this page, candidates will get full information regarding LIC AAO Admit Card 2019. Latest: LIC AAO Admit Card 2019 will be released on April 22, 2019. In the call letter candidates have to do the signature where ever it is necessary and has to affix recent passport size photograph. When the admit card releases then LIC may send you the mail or text regarding the releasing of admit card on the registered mail id or contact number. Check the below mentioned scheduled for knowing more about LIC AAO Admit Card 2019. Download Admit Card: The LIC AAO Admit Card 2019 will be available at www.licindia.in. The candidates who have submitted the LIC AAO Application Form 2019 on time for those only LIC AAO Admit Card / Call Letter is released. The call letter is issued on the official website. Candidates can follow the steps given below for downloading the admit card. 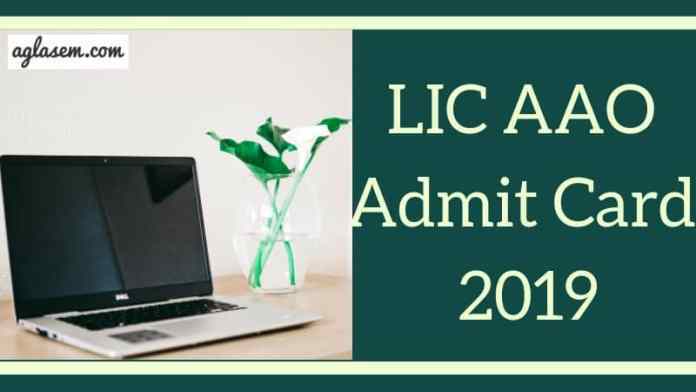 How to Download LIC AAO Admit Card 2019? In the admit card login page mention login credentials. After mentioning the login details hit the enter button. Thereafter, admit card page will open. After downloading the admit card candidates should take the print out of it for future reference. Check the details which usually mentioned on the LIC AAO Admit Card. What to Carry On LIC AAO 2019 Exam Day? It is mandatory for all the candidates to carry the below mentioned documents on the day of the examination. If candidates do not carry the below-mentioned documents on the day of the examination those will be not allowed to appear for the examination. Check the exam pattern of LIC AAO 2019 Preliminary Exam from below. Exam Pattern helps the candidates to know about the marking scheme, type of questions, duration of exam, etc. Candidates equal to 20 times of a number of vacancies in each category, subject to availability, will be shortlisted for the Main examination. The candidates who will be shortlisted for the mains for those only LIC AAO Admit Card 2019 are issued. Candidates can follow the steps given above for downloading the call letter. In the main examination, there are two types of test. One is Objective type and another is descriptive type. The descriptive type test is taken on the computer just after the completion of the objective type test. The candidates have to give the examination by typing on the computer. The objective test will have separate timing for every section. Note: English language in prelims and main exam is qualifying in nature, the marks obtained in the exam are not be counted for the ranking purpose. The candidates who will qualify the main examination by scoring minimum passing marks those will be called for the Interview round and for those only LIC AAO Admit Card for Interview will be issued. The candidates can follow the steps given above for downloading the call letter. After the declaration of the mains result interview of the qualified candidates is conducted. The marks obtained in the interview process will be the part of the final merit list. The number of candidates to be called for interview will be about three times the number of vacancies to be filled. The Life Insurance Corporation of India (LIC) has released the recruitment notification for 590 vacancies to the post of Generalist, IT, CA, Actuarial, and Rajya Sabha. The selection of the candidates for LIC AAO Recruitment 2019 will be done on the basis prelims, main and interview test.